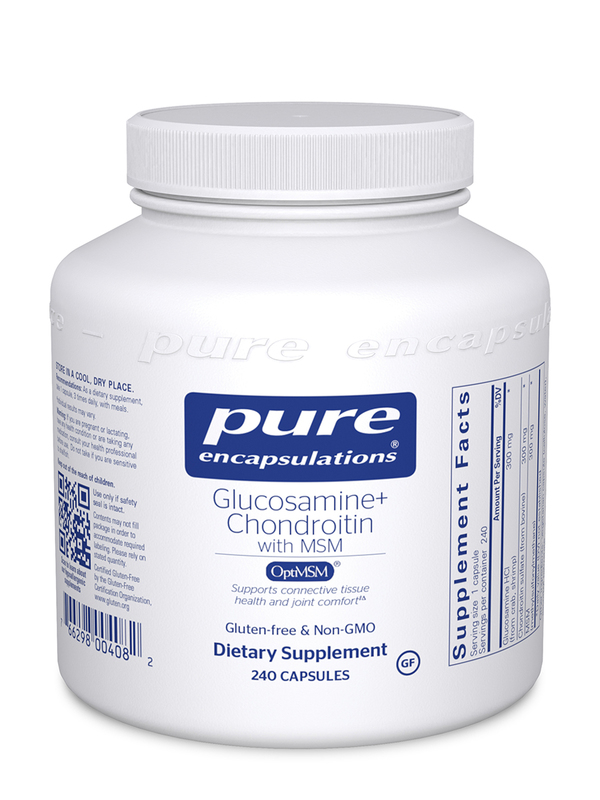 Glucosamine Chondroitin with MSM by Pure Encapsulations is great. I'm 34 and find that this product keeps my joints in great shape. 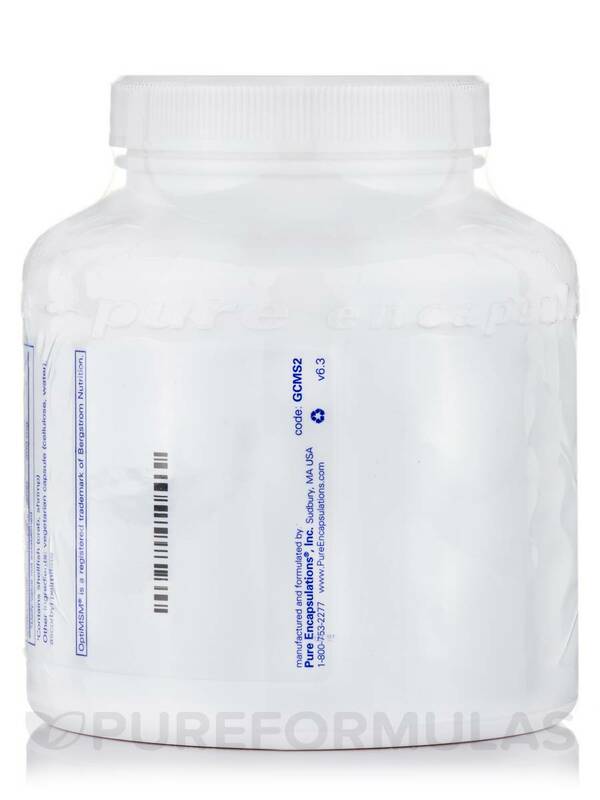 Glucosamine Chondroitin with MSM by Pure Encapsulations is an excellent product. If I miss my dose, my body tells me. Can’t go without. I trust Pure because my doctor put me on other of their products as well. The human body needs an array of compounds in order to maintain healthy joints and connective tissues. Without proper support‚ you may not be able to move comfortably. A supplement such as Pure Encapsulations' Glucosamine + Chondroitin with MSM may promote healthy cartilage‚ which can contribute to a better range of motion‚ less pain‚ and decreased stiffness or inflammation. 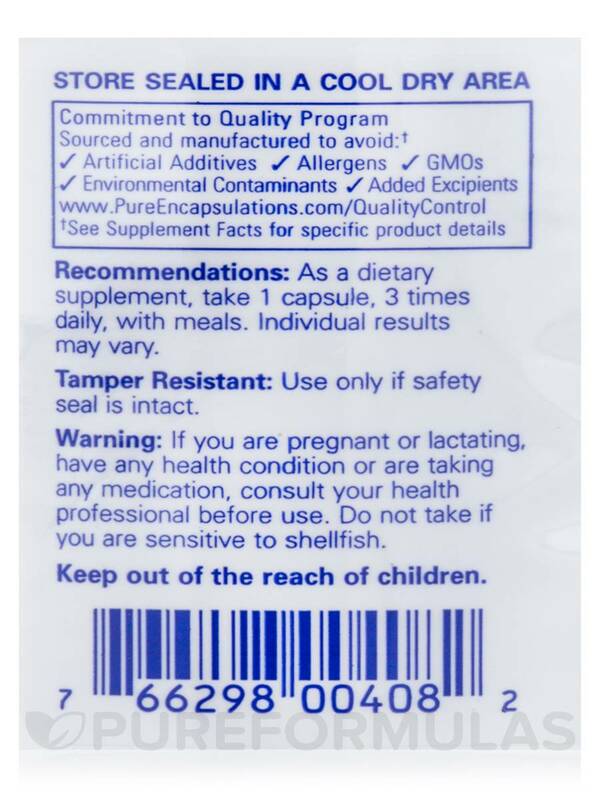 This product contains chondroitin sulfate and glucosamine HCl; the latter helps the body synthesize the former. Chondroitin is a glycosaminoglycan that promotes the production of proteoglycans‚ which are molecules that serve as the building blocks of cartilage. Cartilage itself is a form of flexible connective tissue‚ which is found between bones and other parts of the body; Glucosamine + Chondroitin with MSM may boost its growth rate‚ since the lack of blood vessels causes it to repair itself more slowly than other tissues. Meanwhile‚ glucosamine can promote the integrity of cartilage. Weakened cartilage decreases the amount of cushioning between bones in the knees‚ elbows‚ and other joints; as a result‚ they may rub against each other painfully. Glucosamine helps maintain healthy matrix metalloproteinase (MMP) enzyme activity to alleviate this problem. Finally‚ MSM is sulfur-containing methylsulfonylmethane. MSM might promote the comfort and functioning of joints‚ along with the other ingredients found in Glucosamine + Chondroitin with MSM. The sulfur in particular may enhance the strength of proteoglycans‚ therefore maintaining cartilage tissue. In some cases‚ it may work to alleviate mild joint stiffness that keeps you from staying active‚ especially during the aging process. Take three capsules daily‚ in divided doses with meals. 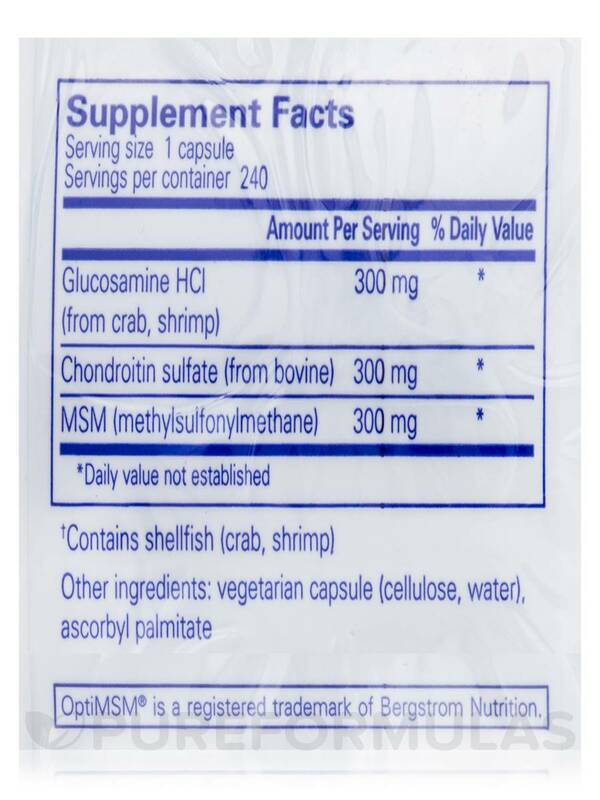 At the recommended dosage‚ each 240-capsule bottle of Glucosamine + Chondroitin with MSM by Pure Encapsulations should last for about three months. Couldn't see where this helped me. Didn't help and it is expensive. Easy to take and very effective. I'm 84 years with a lot of aches and pains. After taking Glucosamine Chondroitin with MSM by Pure Encapsulations for awhile, my aches and pains were alleviated and I was able to be much more active. The activity worked to relieve the pains also so it has become a magic wheel for me. 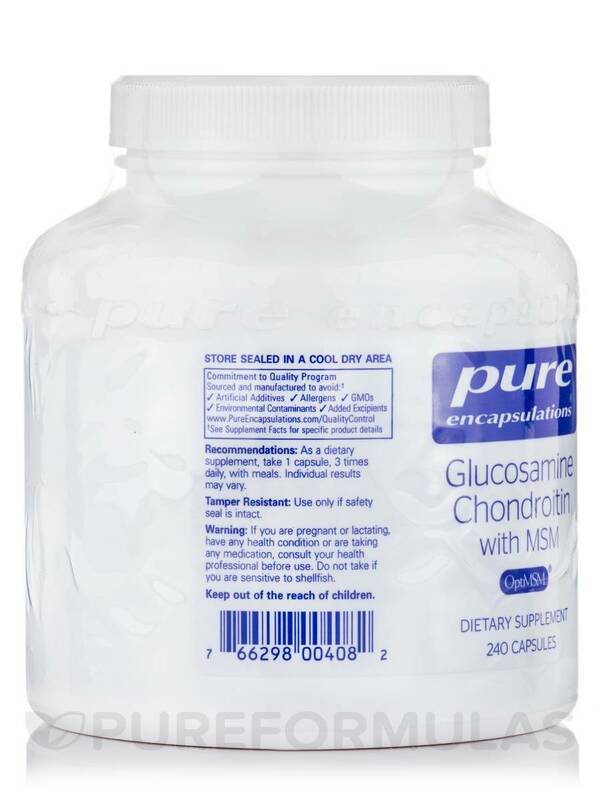 I love Glucosamine Chondroitin with MSM by Pure Encapsulations for the purity and it helps my joints. I ordered this product on the advise of my chiropractor to help with my joints. I have had long standing problems with my joints for years and have tried many products with little or no success. I have been taken Glucosamine Chondroitin with MSM by Pure Encapsulations for about two months. I have noticed a slight improvement in mobility and less pain and I need to give it more time before I can say that it has made a major difference in how I feel. I do believe that it is a very good product and will continue to use it. It has helped somewhat with aching joints where other products have not. I am a very active athlete; running cycling skiing swimming weightlifting practicing yoga etc. I have been training for marathons lately and since I have been taking Glucosamine + Chondroitin with MSM I have no soreness in my joints or muscles. Pureformulas.com carry outstanding line of products that you cant get anywhere else like Pure Encapsulations Klaire Thorne etc. Prices are reasonable and free shipping within 48h is a definite plus!! I love PF! !